The vertical moulding method works by creating a continuous string of flaskless moulds. The creation of every mould advances the line by one until the box at the end is ejected into a Didion drum where sand and castings are separated. We operate two Disamatic foundries each supported by their own electric melting and dedicated sand plant. High-pressure mould production ensures the best possible surface finish and excellent dimensional tolerances. These machines operate at up to 400 moulds per hour. Both are equipped with QPC (Quick Pattern Change over) mechanisms to ensure rapid pattern changeover time. The mould is split horizontally giving a top (cope) and bottom (drag), each half surrounded by a metal ring (flask). This flask reinforces the green sand mould allowing the maximum area of the box to be utilised. 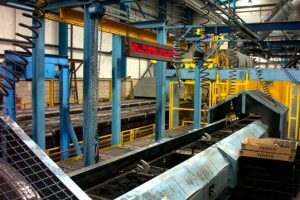 £6 million was invested in a self-contained foundry based around a state-of-the-art GFD ComPac 540 Flask moulding line. Utilising Multi-step dynamic mechanical mould compression, which allows infinite adjustment to achieve maximum compaction on even the most complex of moulds ensuring a high dimensional accuracy and finish of casting. It also further increased our maximum casting weight to 30kg. The flexibility of the four cooling lines gives total control over in-mould cooling producing castings with a more homogeneous structure thereby avoiding the need for heat treatment. The plant is supported by a high tech. sand plant featuring an Eirich high intensity continuous mixer and Scada ‘Process and Control’ visualisation system. 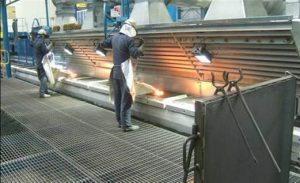 Two 6-tonne induction furnaces provide metal supply. SEIATSU fully automated “boxed” moulding plant capable of producing 240 complete moulds simultaneously on a 750 x 550 x 225/225 flask and is equipped with a pattern change turn table facility to enable exchange of patterns within the cycle of the machine. The plant is equipped with an Eirich and mixing plant and 2 x 6 Tonne medium frequency induction melting furnaces capable of supplying 6 Tonnes of metal per hour. The flexibility of the four cooling lines gives total control over in-mould cooling producing castings with a more homogeneous structure eliminating the need for heat treatment. The purpose built factory allows manufacture of parts from receipt of raw material to completion of finished product through an optimised process flow. Castings are de-sprued, shot blasted and processed on a series of robotic “Koyama” grinding machines to point of despatch.